Phase 2 of the Marvel Cinematic Universe was a bit uneven, but it paved the way for the future. In that, many of the movies in Phase 2 were risky and, when those risks paid off, they paid off in a big way. That being the case, Marvel decided to kick off Phase 3 in proper fashion by adapting, albeit very loosely, one of the greatest and most beloved comic book storylines of all time. Civil War is one of the MCU's biggest, most ambitious and wholly satisfying movies to date and truly helps pave the way for what's to come in Avengers: Infinity War. On our journey to Infinity War, we've looked back at every single MCU movie leading up to the massive event coming our way. So far we've covered all of Phase 1, which culminated with The Avengers, and the entirety of Phase 2, which concluded very differently with the strange but fun Ant-Man. Phase 3, from the very beginning, was always going to be bigger and more daring and Captain America: Civil War showcases the best of what an interconnected cinematic universe can be. Where others have failed, this is where Marvel succeeds and succeeds in true fashion. There's a confidence and a boldness to this movie that makes it feel like something of a victory lap for Marvel Studios. 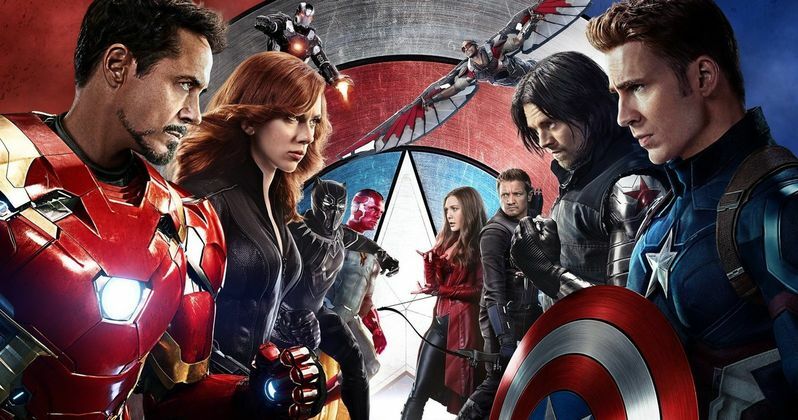 While I'm certain people who don't religiously follow the MCU can enjoy Captain America: Civil War, which is a credit to both Marvel Studios President Kevin Feige and directors Joe Russo and Anthony Russo as storytellers, this movie pays off the most for those who have been following these characters up to this point. It feels like a reward for keeping up with these various storylines over the years. And it's one hell of a reward. Sure, it's not a direct adaptation of the Civil War comic. Not by a long shot. But I've said it before and it's well worth saying again; movies are not comic books and comic books are not movies. They are different beasts entirely and require different things to make them work. That said, this movie very much captures the spirit of the comic and makes for an excellent addition to the MCU. This thing really kicks off with a bang. We get some immediate depth added to the character of Bucky in the cold open, who really has a fascinating arc throughout the Captain America trilogy and makes for a great character, given how his arc wraps up here. Seriously. He's the man who killed Tony Stark's parents. That can't be undone. What a brave and cool choice to make. Following the cold open, we get that outstanding opening action sequence with Crossbones. While it's a shame to lose Frank Grillo, he died for a good cause. That opening sequence beautifully sets up the events that divide The Avengers and pits them against one another in a way we really hadn't seen in a major comic book movie before. Most superhero movies have a clear right and wrong defined within the plot. There are good guys and bad guys. Civil War doesn't and that's part of what makes it so compelling. Are you team Cap or team Iron Man? Or maybe you think Zemo has a point? It's all operating in the grey, to some degree. How easy it would have been for this movie to be an unruly mess. But Captain America: Civil War demonstrates just how smart the Russo brothers are as storytellers and, if ever there were a reason to not be concerned about handling everything they have to handle in Infinity war, it's this movie. They managed to brilliantly and satisfyingly introduce both Chadwick Boseman's Black Panther and Tom Holland's Spider-Man, while also juggling every other character and the many plot points that fuel this story, and it totally works. It's downright impressive. It's perfectly understandable that many will see this movie as something of a downgrade in some ways from Captain America: The Winter Soldier, which is still largely considered to be the best MCU movie to date. But I have zero cynicism about Civil War and every single time I watch it I'm just more impressed by it. It's quite simply a satisfying experience from top to bottom. It's the kind of thing that people who read comic books growing up thought they would never get to see. Yet, here we have a dozen superheroes duking it out with one another for damn near 20 minutes at an airport in what might be one of the most miraculously choreographed action sequences ever. What's not to like? I don't necessarily think that Captain America: Civil War is the best MCU movie. However, when forced to try and find something to complain about, I really come up empty. Even Zemo, being another not wholly satisfying villain for many, is more forgivable to me within the confines of this story. It's more about the divide within The Avengers. Zemo is needed as a common enemy at times, and the character does exactly what he needs to do. There's honestly just way too much to enjoy here. Robert Downey Jr., after eight years playing Iron Man, arguably gives his best performance in this movie. We get to see Vision fleshed out a lot more, General Ross is reintroduced rather brilliantly and Steve Rogers finally gets to kiss a girl! Good for you, Cap! It's easy to drone on about the things that serve to put a smile on one's face when watching this movie, even though it is quite serious and tense much of the time. Watching superheroes literally run faster than traffic on a freeway, Captain America holding a helicopter and, perhaps one of the great fanboy MCU moments, when Spidey and Cap, in the middle of fighting one another, share a moment of respect for each other as fellow New Yorkers. One from Queens, the other from Brooklyn. It's things like that which make the MCU the loveable thing that it is for so many people. Ultimately, Captain America: Civil War deals with sending a simple message; actions have consequences. Not just when The Avengers are saving the world, but for everyone. It's a thread that runs throughout. This movie also asks rather interesting questions. Is there a cost to The Avengers? Is their hero business actually causing escalation? This is the kind of thing that can only happen within a cinematic universe, a concept that didn't even really exist just a decade ago. But now, every studio wants what Marvel has. They someday want to make their Civil War, whatever that may be. This is the movie that serves as a proof of concept. This can work and it can work very well.